Today's Scheepvaartkwartier or 'shipping quarter' is composed of Eerste Nieuwe Werk, an 18th-century urban expansion area round Zalmhaven, and its follow-up scheme Tweede Nieuwe Werk, for both of which Town Architect W.N. Rose drew up stringent rules. There are warehouses, company offices and houses for the well-to-do. The eastern portion past Willemsplein perished during the bombardment and became the site of several reconstruction-era buildings, some themselves replaced now by new-build. Since the end of the 1980s the Scheepvaartkwartier has been back in vogue as a location for housing, offices and trendy eating and drinking establishments. The part on both sides of Parklaan is still fairly authentic. The villas to the north of the strip of green were built at the end of the 19th century for rich Rotterdammers such as Mees the banker and Jamin the manufacturer of sweets and biscuits. J. Verheul's monumental twin houses at Westplein 9-11 are opulently decked out with Neo-Renaissance motifs. The south side of Parklaan has a dense fabric of mansions and upmarket offices. On the east side of Veerhaven is the delightful Calandplein, a quadrant-shaped clearing. The housing units, designed by D. van Ameijden van Duijm, have a trapezium-shaped plan. The Caland Monument by architect Henri Evers and sculptor Arend Odé was moved here in 1939 from the city centre. There are several fine Art Nouveau premises to be admired on the west side of Veerhaven. 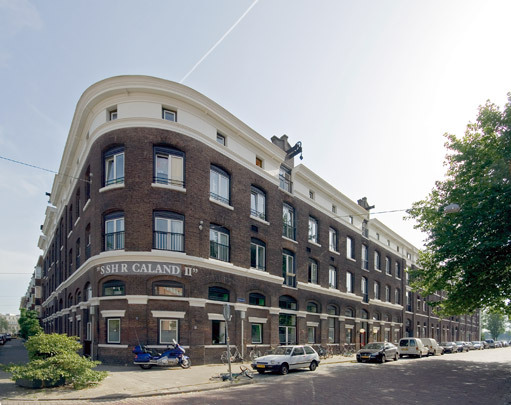 These include the offices of Rotterdam Lloyd on the corner of Veerhaven and Calandstraat (1907), Wambersie the shipbroker at Calandstraat 5-11, Van Uden and SHV. The rest are mainly warehouses, which are concentrated here. The one on Westerkade has a Neoclassicist mock front that closes ranks with a row of houses. Two modernist office buildings from the 1960s overlooking The Park have been radically recast. The headquarters of shipbroker Van Ommeren was in stages transformed into offices and apartments by Ector Hoogstad. The wedding-cake-in-brick opposite was briefly the head office of internet hype World Online.